I have been wanting to finally tackle our laundry room for quite some time. I’m teensy at just 5′ so Babydoll being 6′ has a hard time fitting through the garage door. I had the walls to the left in the picture below lined with shelving for my canning jars and household items, so the pathway could only accommodate me or a child. The door would only open enough me to squeeze through. All you’d hear everytime is “woman!” Haha! I always go to Dollar Tree for a lot of my organization and home products. Not only are most high quality, but they sell metal items as well comparable to department stotes. The plastic storage bins, plastic baskets, and collapsible cloth bins are amazing!! They are good quality and for $1 each you can’t beat it. Similar bins at Target or Walmart are at least $3.99 each or more. Dollar Tree tends to bring in colors according to the season. Bright white, teal, and pinks typically come out in Spring while Fall brings in chocolate brown, rusty red, and burnt orange colors. Sometimes you will find black and navy blue along with the fluorescent and primary colors. If they don’t have a color to fit your color pallette just use spray paint. 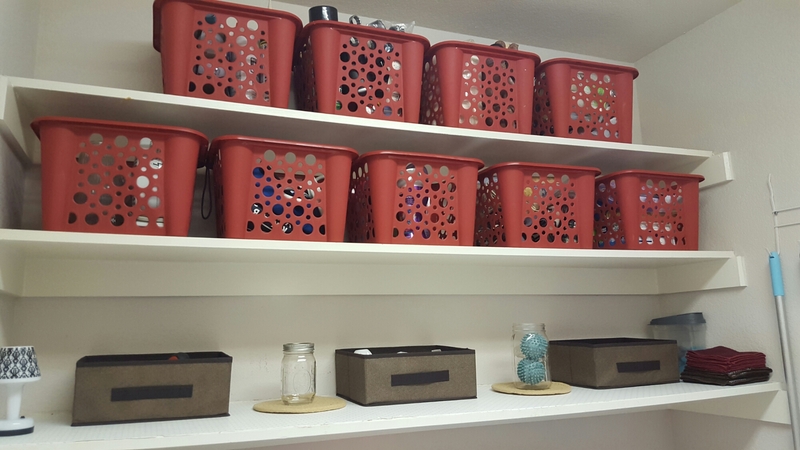 When we moved into our home, I had everything organized in labeled room by room boxes for easy unpacking, but the laundry room tended to hold a lot of the odds and ends because we did recaulking, bug control on the patio, projects, replacing fixtures, etc. After a while, it got really cluttered. So I decided to redecorate it by putting up a spare sheet folded in half and hung in front of all the shelving to hide the mess. 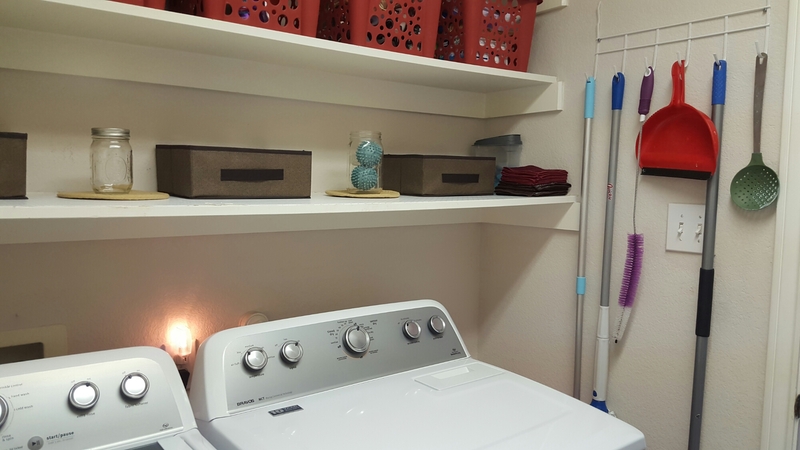 Here is the original laundry room makeover post from last year. I started by emptying the room entirely except the appliances. I steam mopped the floor and wiped down all the walls, doors, shelving, and baseboards. I then organized all of the items on the shelves putting like items together while purging what I could. Then, I filled the baskets as I went along. I put non frequent items at the top and everyday items near the bottom. The art work, ironing board holder, broom/mop holder, dryer balls, night light, plastic canister is all from the Dollar Tree. The rug, ironing board cover, and waste basket are from Target. 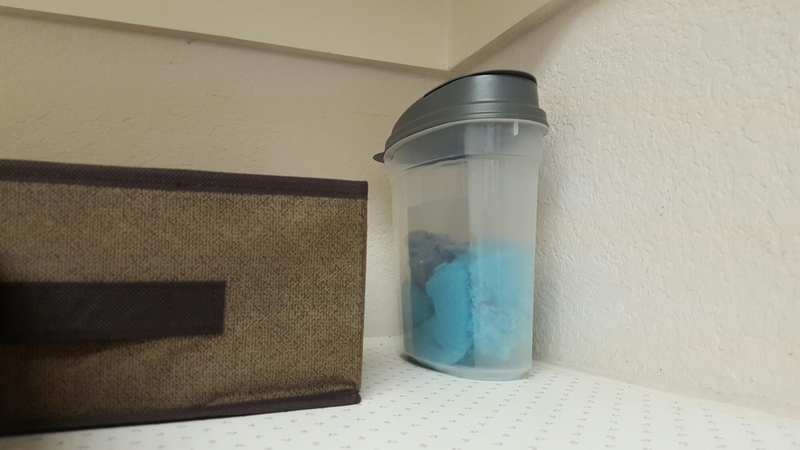 A Lint Container is a must have! We have a Rocket Stove and a fire pit outside. Dryer Lint makes fantastic fire starter as it is highly flammable. Save your toilet rolls, put dryer Lint inside and lite. Tip Jar is a great way to store loose change that makes its way into the laundry. I call this my Dunkin Donuts Fund. 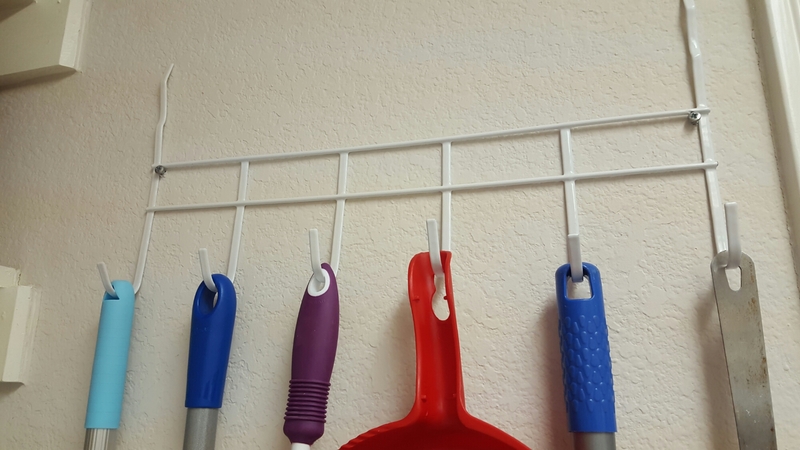 Broom and mop holder for mops, brooms, dryer lint trap brush, dustpan, mixer spoon for the homemade detergent, you name it. Tailor it to your needs. 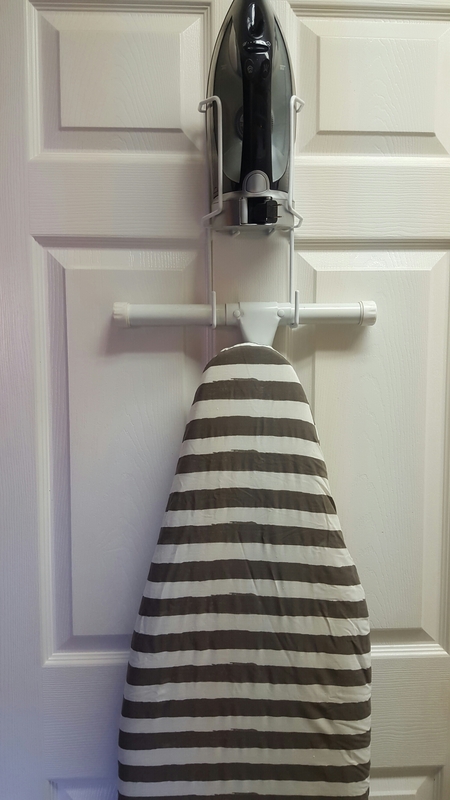 Ironing board holder simply comes two ways. Either to bolt to a wall or hang over a door. The door I wanted to use was an outdoor door to the garage so it wasn’t wide enough for the hooks to fit. 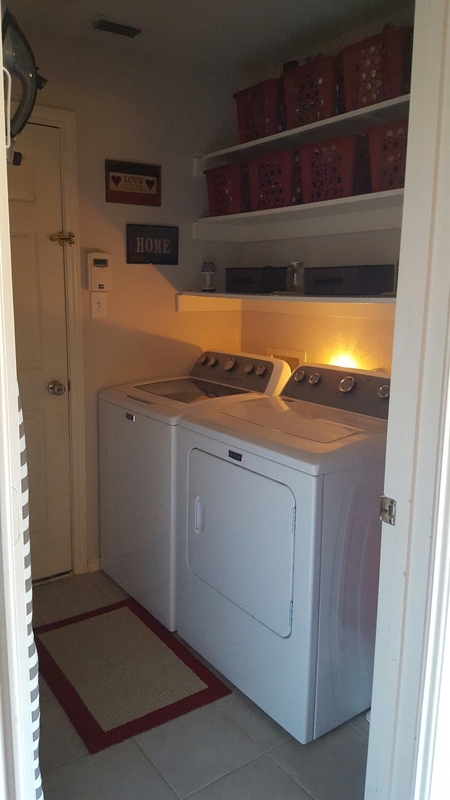 I had to use the laundry room inside door instead. But it is neat because you can use it as a pop of color or focal point of your room. There are tons of beautiful and inspiring prints for Ironing board covers pretty much sold in any housewares section. Dryer balls are a must have as well. They are just plastic balls with texture to fluff your clothes and soften them. They eliminate the need for pricey dryer sheets. The few ive seen in stores will last a long while as they are really thick flexible plastic. One time purchase versus $3-5 every month. Label everything using labels from Dollar Tree. I didn’t find them in this trip, but all the baskets should be labeled to easily find items. This saves time especially seeming I’m short and need a stool. Adjust the decor to your needs and use inspiration from the rest of your home. I wanted it to blend in with all of our decor seeming it’s off of our kitchen and patio. Nightlights and small lamps give a glow so it looks cozy compared to the ugly long commercial light most have. Landry room makeover for less than $50. Happy Sunday Lovelies! I hope everyone is having an incredible summer. The heat is definitely here in North Dallas so I try to keep my outside chores to a minimum. But that definately doesn’t stop me inside. My son is traveling as he does every summer and babydoll is working super hard as usual. This leaves me…bored!! When mama is bored, she cleans lol I’m not kidding. Tonight, I thought I’d give my pantry an overhaul by organizing, cleaning, and purging. 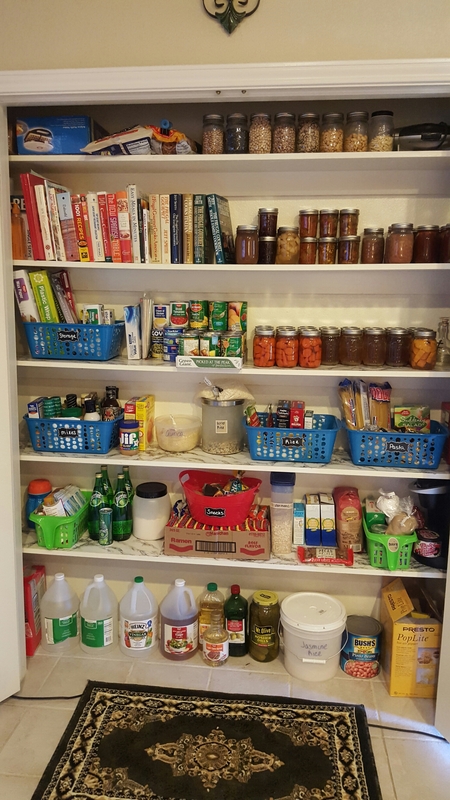 We’ve actually been doing quite well with our pantry stock although we have a ways to go before we have the food storage we need so it is a work in progress. However, I rarely have to run to the store for oddball items because I can work off what I have which is nice. 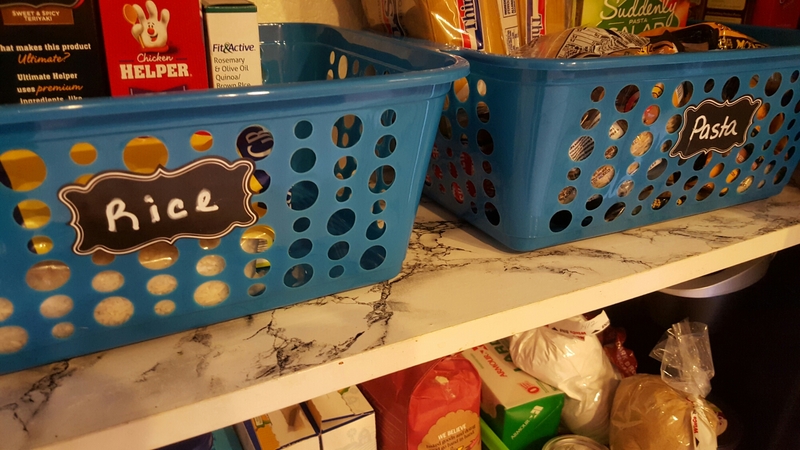 I reused a couple plastic bins I purchased from the Dollar Tree, chalkboard labels also from the Dollar Tree, and pint sized canning jars. 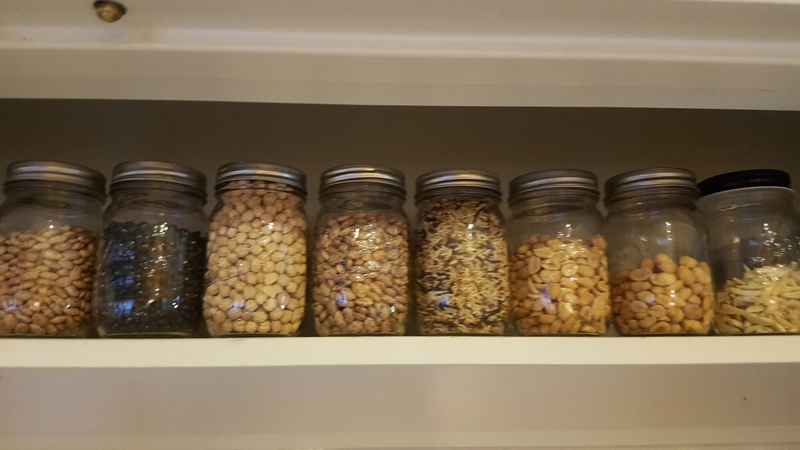 Now, I do can our food basics like veggies, chicken, jams, sauces, stock, beans, and fruit butters, but canning jars are also perfect for storage for things like dried beans, nuts, flours, and rice. I have quite a few cookbooks that I’ve either gotten as a gift, been passed down from my grandparents, or that my mother made for me that contains all her family recipes from both sides of my family. They look much better organized and are more easily accessible. 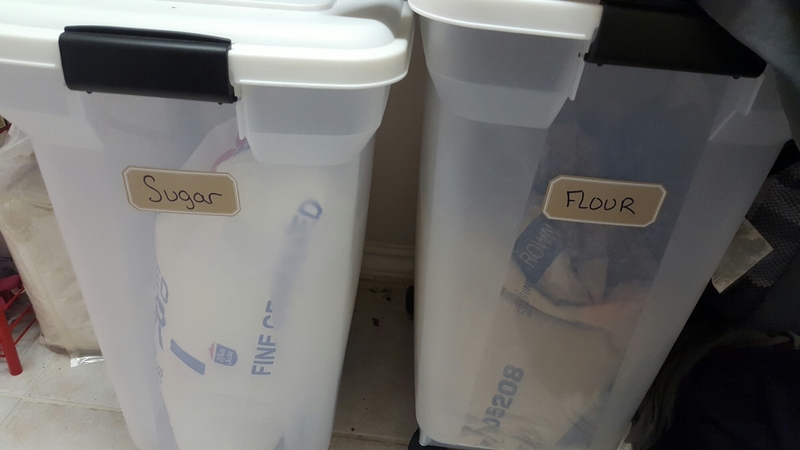 We purchased food grade storage bins to hold our 25lb bags of sugar and flour. Buying food grade containers is so important so be sure to check your buckets, bins, and containers. One of my home management binder inserts is a printable that I created. In searching for free printables online I found they are set up for one income households or households that are paid weekly. In my home, it is bi-weekly. I use a budget printable daily! I swear by it. I use this in conjunction with my Horacio Life Planner (review coming soon). For those that budget this is a great solution. I do not use bill pay through my bank and nothing comes out automatically except Netflix/Hulu. Everything is paid by me, by hand. This allows me to have full control of our money. A monthly tally of expenses. As bills come in I fill in the due date and amount due. At the end of the month, I add it all up and what is ever left over I pop into savings and start fresh the next month. A look at how our bills are paid. If it is with a money order then I can write in my planner before the due date to go to the bank. It keeps me in the know as the due date approaches. At the end of the month I’ll know if I’ve missed anything versus logging into accounts or looking at online banking. If something wasn’t budgeted and if something comes up…I know if we have enough leftover to pay for it. Check them out and print if you’d like! I finally changed the name of my blog. I’m getting a lot more time lately now that I have my home in order, a new planning process, and life is getting on that road to boredom LOL! Things are slowing down and it’s quite nice. I wanted to change the name primarily because I’m not single any longer, but I wanted to reach a broader audience. While my support for a single mother and the power of a woman view will never ever change, it was just time. Same site, just a different name. I think its more fitting. I have new posts in the works for Frugal Fridays and will be doing a series that is really important to me. I’m calling this series Mom, Inc. It focuses on the power of a woman in the home, the struggles, the chaos, and the overwhelming feeling she can have by wearing many hats at once. Honestly, you can ask babydoll, my husband. I run my home like a BOSS! I’m the CEO of our home and I’m very business oriented. It runs like a business. That is how my mind works and that is how I keep my sanity. Here’s a sneak peek! Everything you need to run a successful business, you need to run your home. I run my home…like a BOSS! I’m CEO of our humble abode and I’m damn proud of it. It doesn’t run flawlessly, no business does. But by using certain aspects, our family runs more efficiently. I’m a woman actually works inside my home (I’m employed), a mother of an ADHD/ODD teenager, a wife to a husband who works across country, a step-mother, soccer mom, and a writer. In other words, I’m the CEO, Executive Admin, HR, Accounting, Production, and Maintenance departments all in one. Businesses cannot run by the seat of their pants and expect to make money and save money. Neither does your home. I will be posting in this series starting April 4th. Be sure to check back every Monday for Mom, Inc.
Money is always a headache and bills are evil. Here are some tips I use for staying on track. By writing things down and keeping a log, I am able to stay on top of things without having to think too much. Seeming we are striving for a debt free lifestyle and getting more into homesteading, eliminating future debt and paying late fees etc. is key. I use two main spreadsheets. 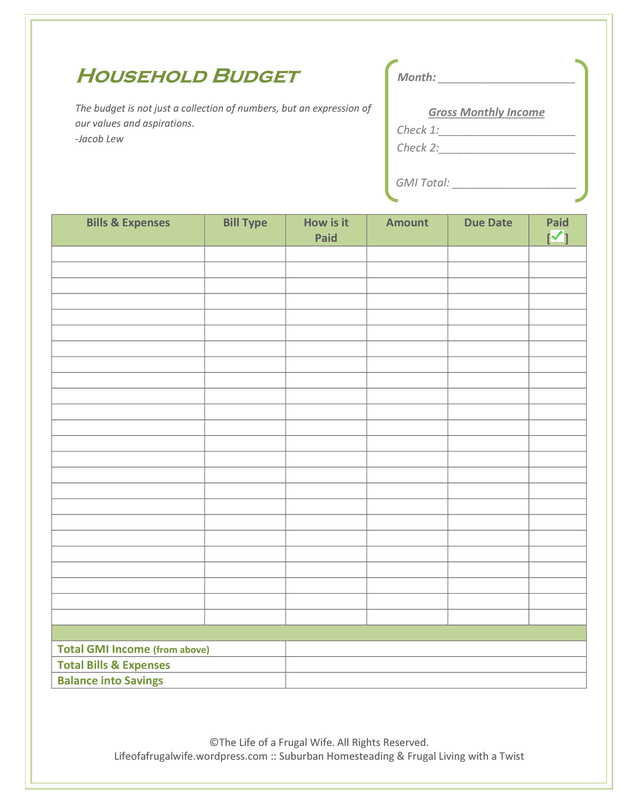 Monthly Budget Sheet: to keep track of bills and when they are due. Our family is paid bi-monthly so our bills are separated into two pay periods. This gives each pay period a designated purpose. Once I receive a bill I then write down the amount due. This does not include past debt. This is just for bills we pay each and every month to run our home. I use a new sheet every month because some bills like our gas and electric vary by a few days. You want this to be as accurate as possible to avoid late fees or that dumb 5% of the total bill late charge. You can create your own in Word by making a template with two columns. Bill list on the left and due dates on the right. Bill Tracker: is to keep a list of bills and then have all of the months of the year in columns across the page to check off that they were paid each month. You can create your own in Excel by making a list on the left and each column header being a month. How I keep organized files: I keep a manila folder to store bills as they come in. When I pay them, I pull the bill and write the date paid as well as how I paid (auto draft/bill pay/debit card, money order), the call reference number, and rep I spoke to to make my payment on the actual bill. I save all bills for one year. When the following years month comes up, I discard the bill from last years month. Giberish? Let me explain. I get a bill for the month of March for Verizon. I file the bill with all my payment information on it in my file bin. Next March, I pay the same bill then file that away while removing the bill from this year and shredding it. It eliminates a ton of paper clutter and overflowing record keeping. Where to find the spreadsheets: Find a monthly budget printable separated by how your family is paid. Either by week, bi-weekly, or monthly. (Google “free budget printables”). There are a ton of super cute ones to keep you motivated! Find one or make one depending on your frequency of pay. How I use my spreadsheets: Every bill should get its own line as well as columns across the page for each month of the year. As they are paid each month, check mark or X out that month to show its been taken care. Any empty spaces will indicate at first glance you didn’t pay that bill. Use both of the above spreadsheets together to create a fail proof budgeting system. This works for our home, but do what works best for you. Getting into the cuteness of it and using creative colorful sheets will help you WANT to use them. Especially if you are a chic like me 🙂 I also have colored Sharpie fine point pens. How to file your spreadsheets: I save this sheet only and file it in my “Annual Payments” folder for quick reference if there ever is a problem. If I need to show proof of payment or there is a discrepancy, I can pull my bank statement for that month in question and show the charge. Ask my husband, I can argue something I paid 3 years ago! It’s that easy! I like the good ole paper and pen technique. Plus by writing it down you can actually visualize where your money is going and how it is spent versus swiping your card card and checking your statements. I know what goes out and what comes in. Every penny is allocated. Whatever is leftover before each pay period I pop into savings. Example: We get paid every other Friday. So if by Thursday before our payday we have $400 in the bank, I will put $395 in savings and start over the following morning with just our new income.